The Problem With Luxmeters / Light meters! British Standard BS667 governs the calibration of luxmeters in the UK, requiring calibration against a tungsten source at a colour temperature of 2856K. This source, called Illuminant A, is spectrally smooth with energy at all visible wavelengths and is similar to the output of an old-fashioned 60W bulb. Unfortunately old-fashioned 60W bulbs are just that, old-fashioned. They are very rarely seen in commercial, industrial or even modern residential settings and will soon be phased out completely. 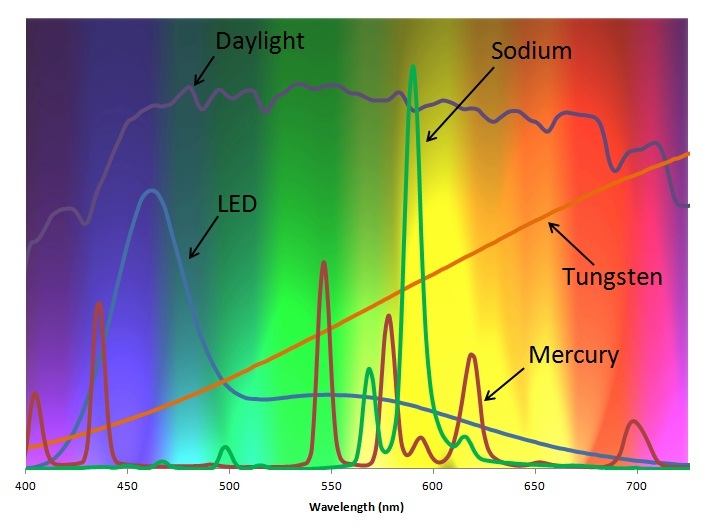 The replacement light sources (fluorescents, metal halide, sodium, LEDs and others) tend to be far spikier sources from a spectral point of view. This can cause a problem when the light level is measured with a luxmeter. The basis of most luxmeters is a silicon sensor with a glass filter and (normally) plastic cosine diffuser which together should give a spectral response matching the V(λ) curve, the CIE standard observer. Established in 1924, this curve is the internationally agreed representation of the spectral response of the human eye. 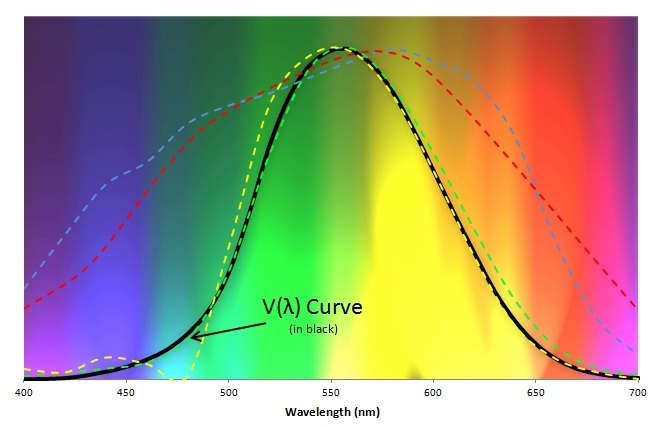 Since our eyes do not respond to all wavelengths equally, using sensors which comply with this curve ensures that light sources of different types which appear the same brightness to us give the same measured value, even though the radiometric power may be very different. The problem is that the match to the V(λ) curve is never perfect and there can be areas of significant mismatch, often including large errors in the blue region. With modern light sources often having a strong blue component this can lead to large errors which may not be consistent between different luxmeters. These errors are not always apparent during calibration to a tungsten source as the spectral smoothness tends to average out the errors. In addition to our UKAS accredited calibration service at 2856K (in accordance with BS667) OTC can now calibrate your luxmeters against your own light sources to provide the highest measure of confidence in your results. These measurements are made using our own spectroradiometer and are traceable to the National Physical Laboratory (NPL).